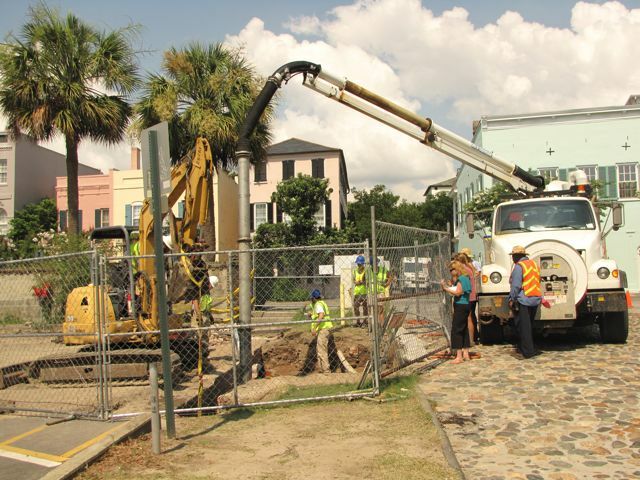 Everybody loves drama, and so the dig site at the east end of Tradd Street was thick with visitors today—at least with those not fixated on the latest news of South Carolina’s gubernatorial drama. There’s so much to tell about today’s archaeological progress, in fact, that I’m going to break this report into two postings. Early this morning the track-hoe arrived, courtesy of Charleston Water Systems, followed shortly thereafter by a water spray/vacuum truck, provide by the city’s Storm Water Service team. With the help of their excellent operators, we soon got to the work of digging into the wet pluff mud on the south side of our colonial redan wall. 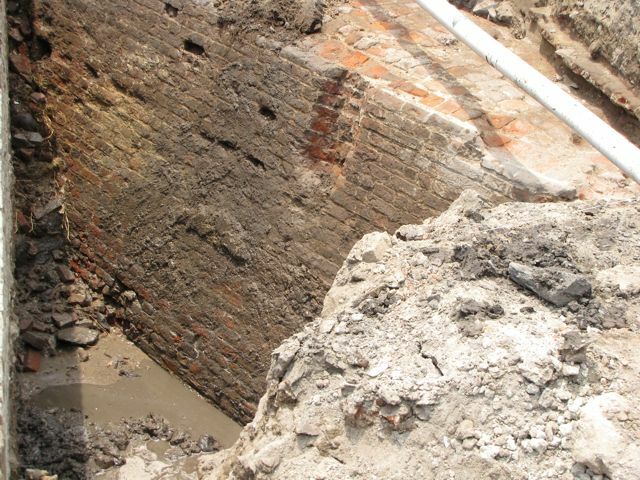 The first priority was to excavate all the soil in the main unit down to the water table. During this operation all of the earth scooped out by the track-hoe was dumped into wheelbarrows and screened by the archaeology students from the College of Charleston. Most of this material yielded the usual assortment of ceramic and glass fragments—eighteenth-century trash—but at least one item really caught my eye. 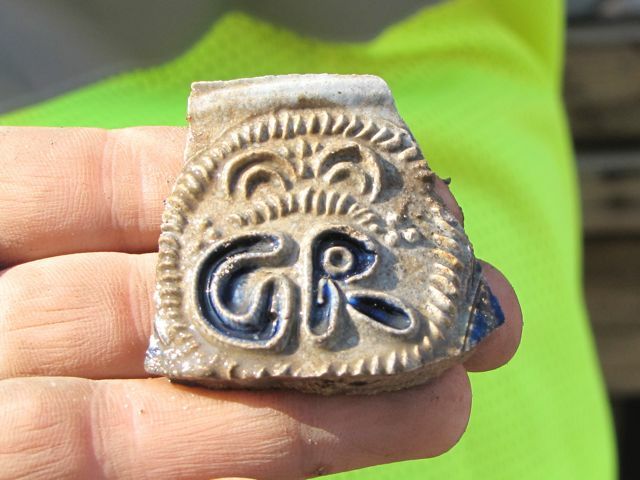 As you can see in the photo at right, the students discovered a pale brown ceramic fragment that clearly bears the blue-glazed raised initials “GR,” which stands for “George Rex,” the King of England. This sherd dates from sometime after the ascension of George I in August 1714. Unfortunately we weren’t able to screen too much of the lower, soggy levels of the unit because the water became a big problem. The solution, of course, was to begin vacuuming with the water truck. 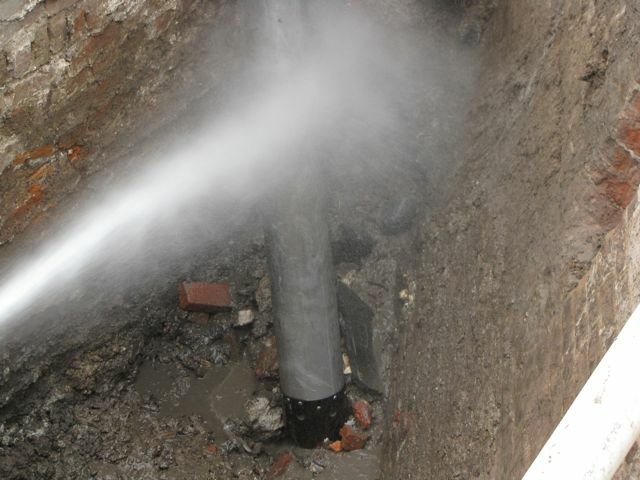 Actually, this operation was a combination of a high-pressure spray to loosen the soil and a high-powered vacuum nozzle to pick up the small debris. The soil removed in this manner could not be screened, but the speed at which the dig progressed more than made up for that loss. Following several rounds of track-hoe digging and water vacuuming, we were left with an unprecedented view of the brickwork of the south face of the Tradd Street redan. Nearly ten vertical feet of this flank is now exposed, which stands as an amazing testimony to the hard-working bricklayers—most probably newly-arrived African slaves—who initiated this work during Charleston’s infant days in the late 1690. But how much more vertical brickwork is there ? We will absolutely know the answer—tomorrow. 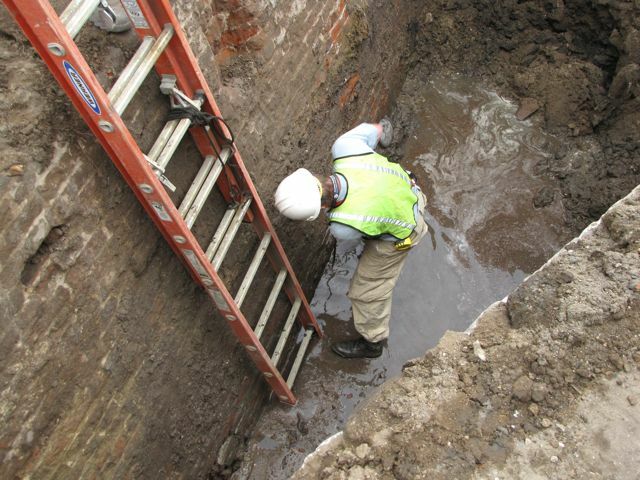 At the end of Wednesday’s work, archaeologist Eric Poplin climbed down a ladder into the muck next to the redan and probed into the muddy water with a steel rod. After a few minutes of jabbing and wriggling, Eric surmised that the bottom edge of the redan is just a few more brick courses—perhaps a foot or so—below the present water line. First thing tomorrow we’ll get right back to this question. Today the Mayor’s Walled City Task Force was also pleased to receive a visit from Charleston’s mayor, Joseph P. Riley Jr., who was enthusiastic about the work and eager to learn about everything that has been unearthed. 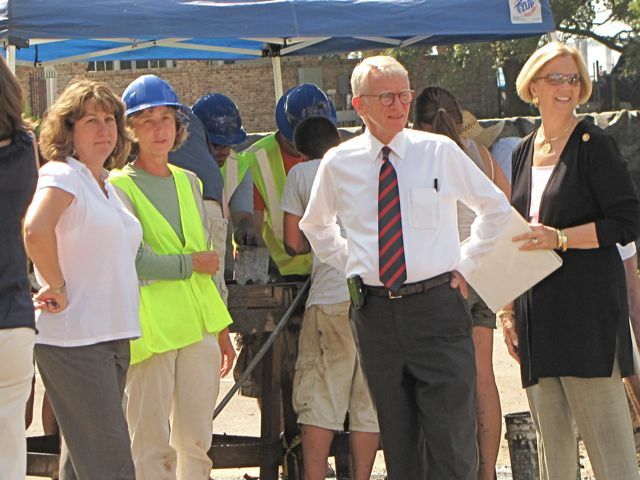 Mayor Riley, pictured here with Task-Force co-chair Katherine Saunders (Historic Charleston Foundation), Task Force archaeologist Martha Zierden (Charleston Museum), and Kitty Robinson (executive director, Historic Charleston Foundation), stated that he was very pleased with results of the endeavor. To him we—and you, curious readers—owe a very large debt of gratitude for his continued financial support and leadership. Having said all this, I still haven’t mentioned the big excitement of the day: the track-hoe was able to extract a large brick fragment of the wall and NINE wooden piles that date back at least 300 years. For that topic, I’ll post another story in a few hours.